The stained glass windows in many churches, universities and public buildings are priceless examples of an artistic tradition that goes back to the late 12th and 13th centuries, when the art of stained glass reached its finest expression in the cathedrals of northern France–Notre Dame of Paris, Amiens, Chartres and others. 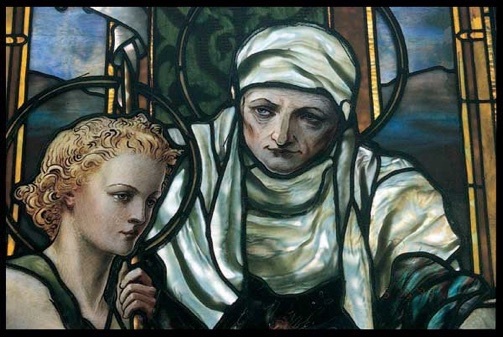 The tradition of stained glass windows reached a peak in America in the work of Louis Comfort Tiffany and John La Farge in the late 19th and early 20thcenturies. These precious works no less than the paintings and sculpture in museums, public spaces and private collections, deserve to be preserved for the inspiration and enjoyment of future generations. Stained glass windows, by their very nature, are fragile, and vulnerable to a host of ills that can compromise their beauty and integrity including age, vandalism, lack of proper structure, and even well-intended but ill-advised repairs. To conserve these treasures of art and craftsmanship, stained glass windows need to be inspected periodically, maintained and when necessary restored to their original condition. Knowing how to evaluate a restoration studio requires knowing a lot about the windows in need of restoration. Clients rarely have the depth of knowledge needed to determine what makes one studio better suited to a project than another. Serpentino staff make it part of their mission to educate clients to the value and condition of their windows, explaining techniques and processes in plain language. Serpentino specializes in restoration. Members of the staff have published articles in conservation journals. Serpentino’s knowledge of stained glass history, materials, and techniques, and their reputation in the restoration community mean that you can confidently entrust them with your precious historic windows. The principals at Serpentino will be working on your windows, from initial assessment, to the work in the studio, to reinstallation. Typically, Serpentino is recommended to clients by their architects, stained-glass consultants, and historical societies. All of Serpentino’s business is by referral. If you would like to know if Serpentino Stained and Leaded Glass is the right studio to restore your windows, we would be glad to provide you with references.